All trains - wherever they have come from - which pass through the station 'POMPEII SCAVI' as part of their journey can only continue towards Sorrento train station as this section of the line does not fork off to any other destinations. Furthermore, do not underestimate how hot it will get with the sun beating down and reflecting off the stone streets and buildings. With this in mind make sure that you take plenty of water and wear plenty of suncream. During the heat of the day and especially during the summer, don't forget sunglasses and a suitable sun hat. Trust me, 3 hours walking round the ruins is going to be tiring even if it isn't hot. As mentioned before, this is very straightforward - so long as you aim for the correct station. The first is 'POMPEI', while the second is 'POMPEI SCAVI'. 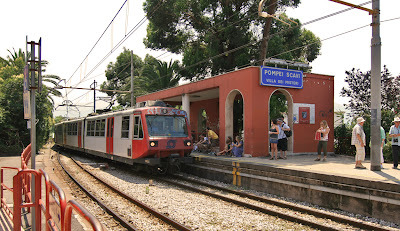 Luckily, the 'Pompei' station in on a different line to the one that leaves Sorrento station. The station you want is 'POMPEII SCAVI' - Scavi meaning 'ruins'. I will suggest that you buy return tickets here in order to save faffing about at the other end. You will be far too hot and tired from 3 or 4 hours of walking around in the baking hot sun to stand in more queues. As I said earlier, you can get on any train at this station as they will all pass through Pompeii Scavi. You are best off sitting on the left hand side of the train as this will expose you to the best views of the Bay of Naples, however a large part of the journey will be in complete darkness as you travel through tunnels cut out of the volcanic rock. The journey takes about 35-40 minutes. You leave the station using the underpass. A point of interest is that there is a toilet in the underpass which costs 1 Euro - something you may well need after your journey, especially as most people exiting with you will refuse to pay it and instead hold on to it a bit longer. You will pick up your train from platform one to Sorrento, which is on the other side of the platform. If there are any seats spare then try and sit on the right hand side for the return journey. Remember to take plenty of water and sun cream.